The Romanesque walking itinerary begins in the Castle Ar­cheo­logical Mu­seums where a rich range of sculptures from St. Stephen’s and St. Mary’s churches is preserved. They were the old Twin Cathedrals, demoli­shed to leave space for the present one. In addition, we can find sculptures from St. John’s church demolished to widen Borromeo College in the 19th cent. Here we also have the opportunity to see from a short distance the portals, the façades’ multicoloured decorations and the sculptures with their unfinished particulars. From the Castle we can reach the nearby St. Peter’s church (12th cent.) whose asymmetrical façade still bears the mark of an old portico. As in every remarkable Romanesque church in Pavia, we can see in the middle of its façade an unusual cross‑shaped window between two “eyes”. The na­ve’s vaults, here as in St. Michael’s, were rebuilt at the end of the 15th cent. with a new te­chnique: in this church maybe to replace a wooden gol­den cei­ling, while in St. Michael’s because the too heavy Romanesque vaults began to fall down. St. Peter’s crypt was remade at the beginning of 1900 du­ring the restoration works followed after a century of decay. In the mo­nument behind the altar, masterpiece of Gothic sculpture, is bu­ried Saint Augustine. In the crypt, in a modern shrine, are preser­ved Severinus Boethius’ bones and at its back there is a well whose water is told to have ailing proper­ties. As in other sacred places, underground waters influenced the choice where to build a sanc­tuary. In the nave right to the stairs lea­ding to the altar, we can find King Liutprand’s buring place. He was a wise Lon­gobard legisla­tor. 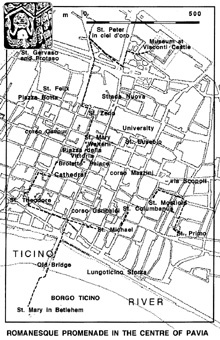 Once crossed the wide Viale Matteotti, go straight on to Piazza Petrarca then turn left on Via Malaspina. Here we can find the ruins of St. Zeno church’s ap­ses, where was once buried Pe­trarch’s nephew who died young. In the house next to it one of the church’s aisles is still preserved. St. John’s church, concealed in the inner part of a block, shows a beautiful Romane­sque stee­ple, some side‑rooms with traces of Medieval paintings and a crypt with an extremely fascinating irre­gular plan, columns from Ro­man monu­ments and 11th cent. fre­scoes (Christ in Glory, The Baptism of Je­sus, Saints). This church, wanted by the Longo­bard Queen Gundi­berga, Theude­linda’s daughter, was built in the same place where there used to be one of the Roman Thermal Baths. It also had a women’s Bap­tistery. In Piazza della Vittoria (Piazza Grande) the restoration of St. Mary’s Wal­terii’s church has been recently finished. It is a 11th cent. church which still bears the name of its founder; it is rich in frescoes and it is presently used to host concerts and exhibitions. At the other end of the square, we can see the Broletto: the 12th ‑ 13th cent.s Town Hall. Its façade was heavily resto­red in 1928, but the inner yard is worth being seen. Walking along Via Omodeo and flanking the Civic Tower’s ruins (the 11th cent. tower fallen down on 17th March 1989), we arrive in Piazza Duomo the old “ Atrio di San Siro” where there once were two Twin Cathedrals whose rests we have already seen in the Castle’s Museums. Then, choosing the narrow and sloping Via dei Liguri, we walk through the old Jewish ghetto once called Rovelecca. At the end of it, we turn right on Via Cardinal Maffi and from this place we can see the wonderful fore­shortening of St. Theodore church’s apses and its base of the cupola (13th cent.). This church is like a small jewel. It is all made of bricks with a three‑floor base of the cupola and a 16th cent. small lantern based on the top of it. Inside it is rich in frescoes dating from the 13th to the 16th cen­tu­ries among which the famous view of Pavia taken from a great height (1522) showing the town in detail. The crypt, wide as the whole church, is intere­sting for its capi­tals with grotesque images among which several two‑tailed mer­maids stand out. Going back on Via Maffi and keeping straight on, we arrive to St. Mi­chael’s church, the most important and typical example of Romanesque ar­chitecture in Pavia. Besides visiting the church insi­de, it is worth walking around the outside walls, among big vaults and ruins of old towers, just to taste its outward part and its fitting in the town context. Don’t forget to have a look at the Vicarage’s yard from Piazzet­ta Azzani (which still bears its Medieval look on a whole side and frames the mighty transept’s front) to see from a short distance the magnificent apse, with the signs of the sandstone corrosion. From Piazzetta Azzani we can reach Vicolo San Colombano . San Colombano’s small church (13th cent.) has been re­cently re­stored as a private residence. 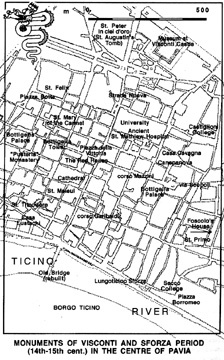 Then, walking toward Via Porta, we turn left between the two Romanesque towers built as ornaments to private residences: don’t forget that Pavia was called the “one‑hundred‑towers town” (but they were more than one hundred!). On the right we can see Santa Mostiola’s Nunnery, desacreted in the 18th cent. and then home of a Youth Institution no more working nowadays. In order to better taste its Ro­manesque remains, turn right on Via Ressi. We will be able to see through an open garden door the octagonal base of the cupola, the apses’ ruins and what is left of the nunnery. This garden is uncorrectly known as “the Longobard kings’ garden”. We end our itinerary at St. Primo’s church which, with its restored façade and remade inside, stores precious paintings of the 14th ‑ 15th centuries. Also this itinerary begins in the Visconti Castle as it was the symbol of more than two centuries dominion of the Visconti and Sforza families (from the second half of the 14th to the first half of the 16th cent.). At this purpose, we can see inside the castle the frescoes and pain­tings rich collection and a wooden model of the Cathedral. From this starting point, go straight on to Strada Nuova, the old town Kardo reopened and restored by the Visconti, which from that time took the present name. Then, keeping straight on in order to reach Piazza Grande (Piazza della Vittoria) we pass the University, settled by Lodovico il Moro in the previous Az­zone Visconti’s re­sidence of which it still keeps some traces. Once in the square, we can see the “Red House” or “Diversi’s House” built in 1376 ‑ 1383 by Nicolino de Diversi who was “maestro delle entrate” (financial officer) at the Visconti court. From Piazza della Vittoria we can reach St. Mary of the Car­meli­tes’ church whose project is strictly entwined with the Castle one, both for hi­sto­rical and stylistic reasons. Then, arriving in Corso Ca­vour we can look upward to discover the 15th cent. Cristopher Bot­tigella’s Tower by the UPIM Department Store. Inside the opposite building it is still preserved a wide hall with hanging terracotta capi­tals that was part of Bottigella’s Resi­dence then enclosed in the Se­natore’s Monastery. We now approach the Cathedral (Duomo), whose construction began in 1488 by will of Cardinal Ascanius Sforza. In the nearby Via Menocchio we can visit the 15th cent. Theodota’s Nunnery enclosed in the present Epi­sco­pal Seminary. Going down the flight of steps we are now in Via Regina Adelaide where the house built by will of Bishop Grassi at the beginning of the 15th cent., stands out for its restoration conceived to achieve a styli­stic integration. Walking down Via Porta Pertusi, we can reach the remains of the Eustachi’s Residence with its beautiful portal. Also this building, owned by the town municipality, was restored by architect E. C. Aschieri in 1965. The Eustachi were a fisher­men family from which was born Pasino degli Eu­stachi Captain of the Ducal Fleet which defeated the Venetians in the naval battle on the river Po. In Via dei Liguri, going back toward the Cathe­dral just before rea­ching St. Maieul’s Cloister, we can still see a fine Gothic portal with the emblem of Christ and two mono­grams. The Covered Bridge over the river Ticino is a bad copy of the one built in the middle of the 14th cent. and destroyed in 1948 be­cause of the dama­ges of the 1944 bombs. The present bridge is a faint copy of the original, with a concrete structure covered by bricks. Between Via Alboino and Via Porta Nuova there is a quite big residence of the Visconti Times which was in origin larger and also enclosed a wider yard. The restored remaining part is still charming and looks onto a garden. It also has interesting rooms of the 18th cent. which can’t be visited as they are presently part of a private residence. In St. Primo’s church we can see the Sforza times nave with inte­resting frescoes and a marble statue of the saint (14th cent.). On the nearby Via Bernardo Sacco stands out the Lonati Resi­dence’s por­tal with a memorial tablet of 1456. The inside part has been remade during our century. In Piazza Borromeo there is the former Sacco College (the pre­sent St. Margherita Hospital). In Via Foscolo it is important to visit the Cornazzani Resi­dence. This house is a beautiful building of the 15th cent. still preserving some inte­resting fre­scoes; it is also called “Foscolo’s House”. We close our itinerary with a visit to Bottigella’s Residence in Corso Maz­zini by Piazza del Municipio (the present Gandini Col­lege),Saint Mary’s church (planned by Bramante), Cavagna’s Resi­dence in Via Defendente Sac­chi (recently restored) and Castiglioni College with its really interesting cha­pel covered with frescoes. Outside the old town walls there are several interesting building to visit such as: St. Salvatore’s church (St. Mauro), St. Lan­franc’s small cloister, Mirabello Castle, Caselle Farmhouse (Zerbolò), Bel­vedere Farmhouse (nearby Scarpone area on the road to Broni‑Stradella) and, of course, the Carthusian Monastery.